Rugs are a clever accessory to freshen up a room, welcome guests into your home, catch spills in the kitchen or serve as a designated play area. The problem is gorgeous and functional rugs are expensive and they usually don’t last long. After all, we’re stomping all over them all day. Why spend tons of money on expensive rugs when you can DIY your favorite trend into a statement or highly functional piece for less? That’s why we rounded up 33 DIY Rugs to inspire your creative juices! We love the bright colors and patterns of this Chevron Rug from The House That Lars Built inspired by friendship bracelets. Ugly kitchen rugs got you down? DIY your own Custom Kitchen Rug from Dream A Little Bigger with any color scheme for some matchy matchiness! This DIY Crochet T-Shirt Rug from The DIY Mommy is simple, inexpensive to make and makes a statement in a room or entryway. Make a Chunky Hexie Crochet Rug with t-shirt yarn. My Poppet shows you how with an instructional video to guide you through the hexie crochet motif! Dress up your bathroom by making a shag rug using old t-shirts! Gentri Lee shows you how easy it is to DIY a Shaggy T-Shirt Rug. This Knitted Rug from Sew and So is chunky and feels wonderful under your feet and the best part is it’s made from recycled sheets! It’s the perfect rug to place by your bed and step onto every morning. Create a rug of any size using a vinyl floor remnant as a base to make this Quatrefoil Design Area Rug. Perfect for under the kitchen sink! Download the pattern to copy from Momtastic. You won’t believe this patterned rug is made with a sharpie. Get the full instructions for this Sharpie Rug at A Nest For All Seasons! This coaster turned DIY Felt Rug is super cute for whipping your feet. Get the easy step for this do it yourself craft at Next Design Studio. Make these no sew Painted Fabric Canvas Rugs from Mark Montano in any size and style to match your home decor. Don’t spend tons of money buying expensive outdoor rugs. DIY your own fun Stenciled Outdoor Rug using a few simple tools. Full tutorial at Everyday Dishes. This Drop Cloth Rug from Nellie Bellie is a beautiful and simple Aztec wonder, created from just a drop cloth and paint! How adorable is this DIY Mod Podge Fabric Rug from Damask Love? It’s 100% functional, stylish, durable and CHEAP! The House That Lars Built makes this Matisse Inspired Cut Out Rug look easy to make. A beautiful floor piece for a large room! Need a durable play mat for the little ones? This Technicolor Play Mat from Sew Home Grown is easy and cost effective! Pom pom’s aren’t just for cheerleading, add them to a doormat for a cheery, warm greeting to welcome your house guests. Get the Pom Pom Rug tutorial at Shrimp Salad Circus! Your feet will love stepping on this spa worthy rug made from rope. Mama in a Stitch gives you the free pattern for this Spa Rug! Give a raggedy doormat a facelift with this Let’s Stay Home Doormat from Pretty Life Girls. All you need is stencil and some paint! Dress up your entryway with a pretty, durable and affordable DIY Rope Rug made with a rustic touch, this is sure to stand up to the elements while keep your doorstep looking pretty. Full instructions at The Seaman Mom. Adventures in Making gets creative by using contact paper and a little spray paint to turn a boring rug into a custom piece of art in this DIY Spray Paint A Briar Rug! Oh, faux you didn’t! Learn how to dye almost any synthetic material with this simple tutorial from Paper & Stitch to transform it into a beautiful DIY Faux Rug! Recycle scrap fabrics and old clothing to make an attractive eco friendly Crochet Scrap Fabric Rug! Why let them go to waste when you can turn it into a gorgeous DIY. Full tutorial at My Poppet. Take your wine cork obsession to a new, healthy level by making a DIY Wine Cork Rug. Great for a bath or shower! Crafty Nest shows you how to do it. Designed Improvised has a clever solution to making this Insanely Awesome DIY Outdoor Rug using spray paint and masking tape. If you’re itching for a DIY project to fill your evenings, this Static Lines Woven Rug from A Beautiful Mess will keep you entertained! Not only that, it will make a bold statement. Old jeans don’t fit anymore? Don’t throw them out, turn them into a Denim Rug. It’s not very complicated either. Just cut and sew the pieces together! Get the instructions at OhOh Blog. This Rag Rug from A Piece of Rainbow uses old t-shirts and a cardboard loom or hula hoop loom to make this piece of foot art. Perfect for decorating the kids playroom! 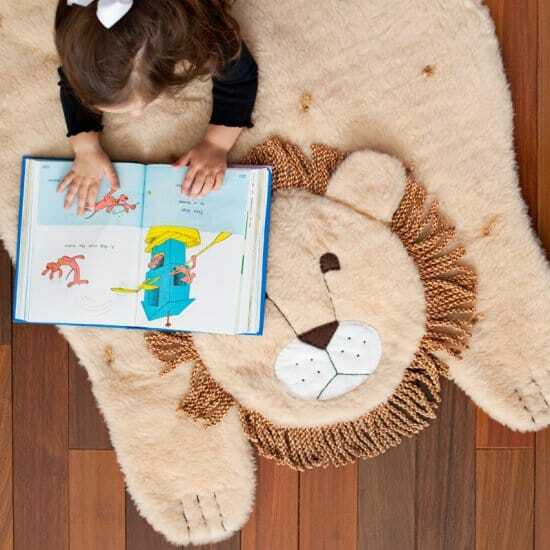 The kids will go crazy for this Plush Animal Mat from A Beautiful Mess! 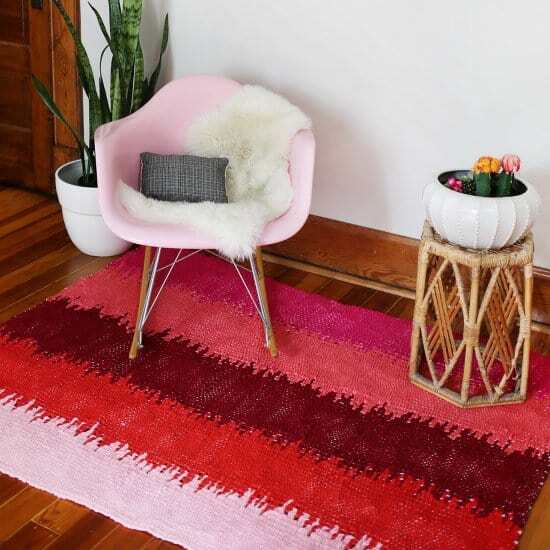 No need to spend a lot of dough on an expensive rug, DIY your own fluffy area rug with yarn wool and baker’s twine to make this darling looking Fluffy Shaggy Wool Yarn Tassel Rug. Full tutorial at Urban Sleek Blonde. You’re just a little astro turf away from creating a fun outdoor rug or play mat! Perfect for toys, shoes or to celebrate warm weather. Pink Stripey Socks shows you how to DIY this playful Astro Turf Mat! Donuts are good to eat and good for making DIY Donut Mats. Warning it will leave you hungry! Get the details at The House That Lars Built. How cute is the outdoor Painted Patio Rug from A Beautiful Mess? A great way to jazz up your outdoor living space and you can be so creative with the color scheme too!